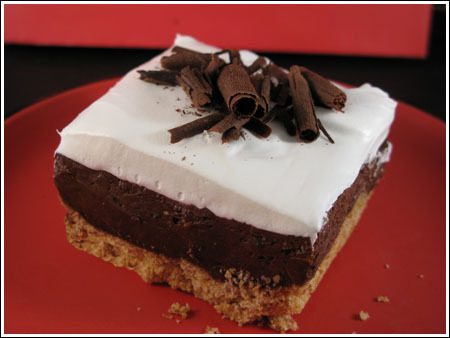 Chocolate cheesecake made in a petite size (6x3) inch loaf pan. Preheat oven to 325 degrees F. Line inside of a petite loaf pan with non-stick aluminum foil, leaving a small overhang for lifting. Mix together crumbs, sugar and butter; press mixture into bottom of the lined pan. Using microwave or double boiler, melt the chocolate chips In a medium size (2 quart) mixing bowl, combine melted chocolate and cream cheese; beat until well mixed. Beat in sugar and vanilla extract. Add egg white and stir until smooth. Spoon chocolate batter over graham cracker crust; Place the mini loaf pan in a square pan (8 or 9 inch) and pour warm water into the square pan so that it comes halfway up side of the loaf pan. Bake at 325 degrees F. for 30 minutes. Remove loaf pan from water and let cool to room temperature – about an hour. Transfer to refrigerator and chill for 3 or more hours. About an hour before serving, spread whipped cream over top of cheesecake. When ready to serve, grasp foil and carefully lift the cheesecake from pan. Place on a cutting board and slice into two square pieces. Place each piece on a dish and top with fresh strawberries.